Despite the fact that some are better deals than others, you probably aren’t going to want any of them. The reason: They’re all pricier versions of what you can already achieve on your own — often fairly easily. You can take care of the line-skipping aspect by booking sights in advance (and, in a pinch, using these tricks). And not only do most people find they tend to use public transport less frequently than they’d expect, but if they do want unlimited access for the convenience, they can buy a far more economical version directly from Rome’s transport agency. (These unlimited transport passes can be purchased at any tabaccaio or at ticket counters at the metro stations, and they include unlimited access to the metro system, buses and trams. The 48-hour pass costs €12.50 and 72-hour is €18). Finally, the cards often overhype what they include. 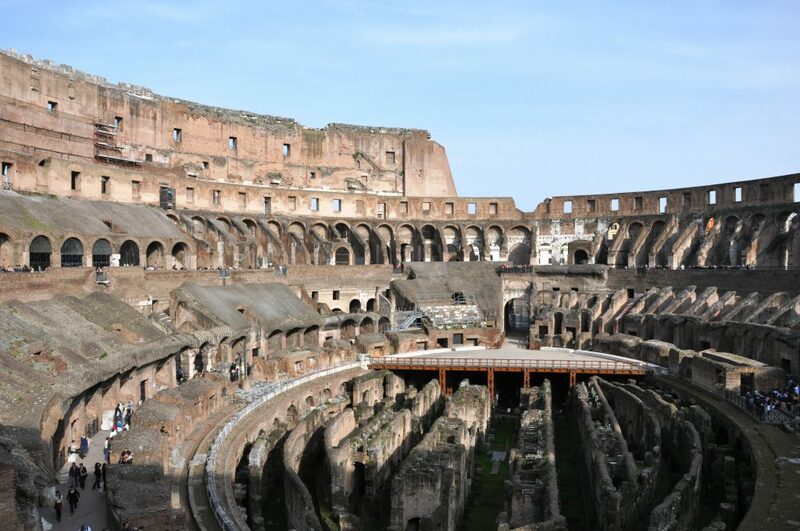 One example: The Omnia says it includes free entrance to the Colosseum and to the Forum/Palatine. But the two sites are already on the same single, combined ticket (which you can book yourself for €14; more on how to do that was in the previous section). Worse, they can be downright price-gouging. Most charge you (sometimes the same as an adult price) for a child’s card. And yet under-18’s already get into free at state-run sites (including the Colosseum), and under-10’s go for free on public transport when accompanied by adults. Still curious? Here’s more about each type of pass, and the (relatively rare) circumstances in which you might want each type. The classic option, the Roma Pass now has two versions. The 48-hour Roma Pass gets you free entrance to the first museum or archaeological site that you visit (except for the Vatican museums and Sistine Chapel, which aren’t part of the Roma Pass network), unlimited public transport for two days, and (relatively minor) discounts at sites across Rome. It costs €28.50. (Note: All prices and information current as of May 2017). The only difference with the 72-hour Roma Pass is that you have free entrance to the first two sights you visit, not one, plus three days of public transport. It costs €38.50. •You’re in one of the categories of visitors who already receive free entrance to the sights. Though it’s smart to double-check each site individually, for state-run museums and archaeological areas, like the Colosseum, this includes children under 18, along with university students or teachers (even non-European) who are studying subjects like archaeology or art history who have a valid certificate of enrollment or document for the current academic year. •You’re in a category who receives discounted entrance to sights. Again, double-check — but this often applies to, for example, European students between 18 and 25 years old. •You’re already planning to take tours which include the entrances to sights. •You’re not planning to visit a more expensive sight (for the 48-hour pass) or two of the more expensive sights (for the 72-hour pass). •You’re traveling on a budget. Even if you plan to use a great deal of public transport and visit two of the priciest sites, you’ll likely still spend a few more euros on the RomaPass. •You’re not doing guided tours, you’ll be paying full-price entrances to sights and you’re organized enough to visit your two most expensive sights as soon as you get the Roma Pass. •You’re a fan of spending a little bit more money to save time. Instead of, say, buying a 72-hour public transport pass, plus booking the Colosseum online in advance, plus buying your ticket at the Capitoline Museums, you can buy one Roma Pass and get all three done at once. You can buy the Roma Pass online or when you arrive in Rome; sale points include the Termini and Spagna metro stations and any participating museum or sight. Check romapass.it for the full list. Is a Rome City Pass (aka Turbopass) worth it? 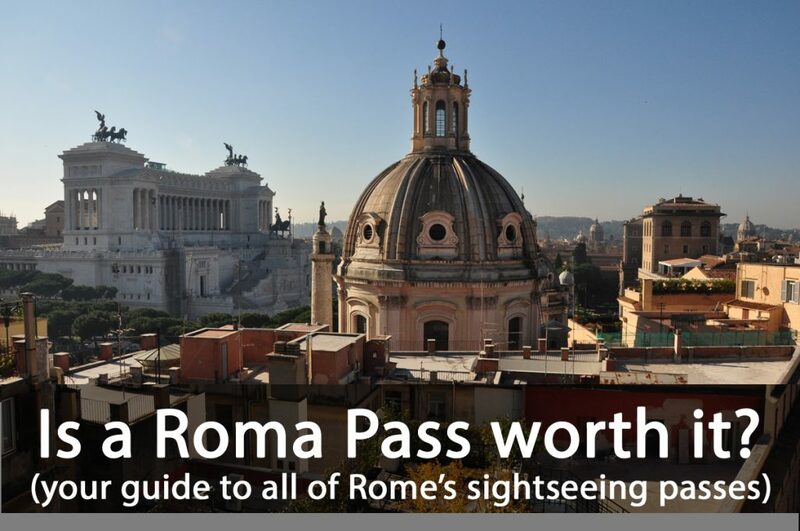 The Rome City Pass offers a little bit more than the Roma Pass (though less value). It includes unlimited public transport for the time you buy. It also includes free entrance to the Vatican Museums and Sistine Chapel (a maximum €20 value), the Colosseum/Forum/Palatine (€14 value), and to a handful of other less popular sights, like the Baths of Caracalla, plus discounts to some others. 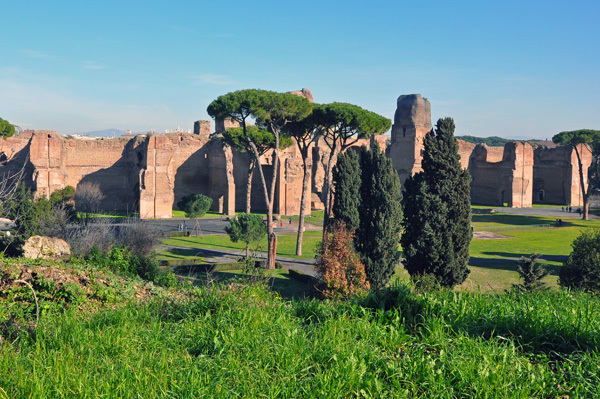 The Baths of Caracalla are beautiful, but do you need them on a combined pass? It also includes audioguides for the Vatican museums and St. Peter’s Basilica (neither of which are much to write home about), and a hop-on, hop-off sightseeing bus tour with one of two operators (but for only 1.5 to 2 hours, which seems sort of pointless, particularly as it’s the rare time indeed I’ve ever heard rave reviews about the information given on a bus tour). (More about bus tours in the next section). 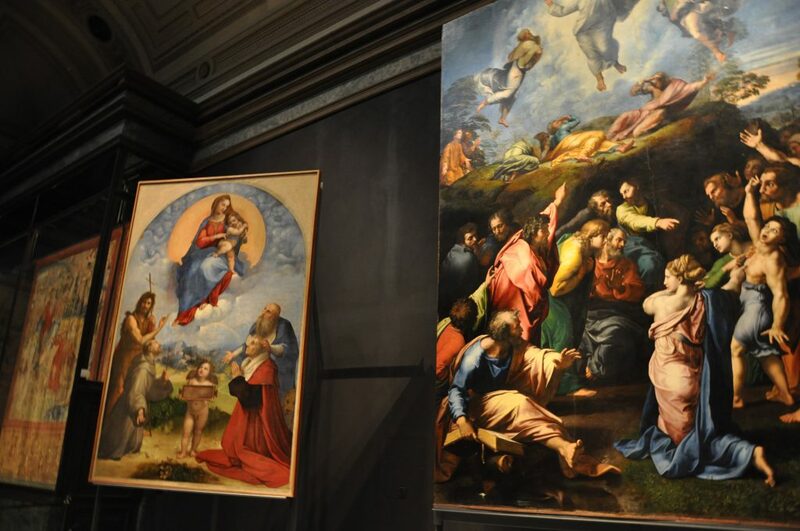 For an adult, that will cost you €89.90 for the two-day pass, €99.90 for the three-day (which also includes free entrance to Castel Sant’Angelo) or €159.90 for the six-day version (which also includes free entrance to Castel Sant’Angelo, the Borghese Gallery plus to sites along the Appia Antica). Interestingly, the Turbopass is the only of these full-package passes that’s relatively honest about how much children cost. A child’s card costs €28.50 for two days, €29.90 for three days and €29.90 for six days — making it more reasonable for kids, actually, than the Roma Pass. Particularly where the adults are concerned, though, work out the math, and you’ll find that — even if you were planning to do everything included in the pass — the convenience comes at a cost of another €15 at least. And even if you’re a fan of convenience, you could buy the two-day Roma Pass for €28.50, plan to see the Colosseum first to make it free, buy Vatican tickets online for €20 and still have an extra €50 in your pocket to spend on audioguides and, if you really want, a bus tour. I know what I’d go with. •You already were planning to do everything offered on the card, including bus tour and audio guides, and you don’t mind spending an extra €15-plus for the convenience factor. You can book the Turbopass online here. Is the Omnia Vatican & Rome Card worth it? Starting at €113 for an adult, the Omnia Vatican & Rome Card is an even more expensive version of the Rome City Pass — and basically, all you’re paying for is a tricked-out package that includes the 72-hour Roma Pass (which on its own, remember, costs €38.50), plus some items aimed at those interested in the Vatican. The only main additions to the Roma Pass are that it includes free entry to the Vatican Museums (on top of the Roma Pass entry to two other sites); the (pretty mediocre) audioguide for St. Peter’s Basilica; and that it gives you a hop-on-hop-off bus tour ticket with Roma Cristiana (which is run by the Opera Romana Pellegrinaggi, a group focusing on services for pilgrims) that’s good for three days (technically, a €32 value). (You might want to check out the most recent Tripadvisor reviews of the Roma Cristiana bus before you pull the trigger). It also claims to give you “fast-pass” entrance to St. Peter’s Basilica, but this is a bit of sleight of hand: what you actually get is an group audio tour, and while that group does use a side entrance to skip the main line to the basilica (though you still have to go through security), you have to be there at precisely the right time to avoid waiting, since those tours only enter at certain times. If you were on the fence about the Roma Pass or Turbopass being worth it, though, then this one almost definitely isn’t. The Omnia package is the priciest of them all: currently €113 for an adult, €80 for a child… and children apparently count as only nine years old and under. So yes, your 10-year-old will cost an exorbitant €113 — even though, without the card, they’d get into sites and travel on public transport for free. Even for adults, it’s unlikely that this is worth it. For an adult, including booking fees, the Vatican costs €20, the Colosseum (and Forum and Palatine) are €14, and the Borghese Gallery is €17. A three-day transit pass is €18 and a hop-on hop-off bus is €30. That’s €99 total, saving you €14 if you booked each on your own, and that’s assuming you’re going to do all of the main things on the list — which you probably wouldn’t. •You plan to do everything offered on the card — including the bus tour — and you don’t mind spending an extra €15-plus for the convenience factor. You can buy the Omnia pass here. Is an Archaeologia Card worth it? This card is exactly what it says it is, it isn’t fancy, it’s the cheapest of the lot — but unless you’re planning to visit some of Rome’s off-the-beaten-path archaeological sites, it’s still unlikely to be worth it. Good for seven days, it includes access to many of Rome’s main archaeological sites and museums, including the Colosseum/Palatine/Forum (a maximum €14 value); the Palazzo Massimo, Crypta Balbi, Palazzo Altemps and the Baths of Diocletian (which are all on one combined €7 ticket anyway); and the Baths of Caracalla along with some of the sites along the Appia Antica (which are on a combined €6 ticket). The ticket costs €23 adults, €13 reduced. •You’re planning on visiting the Colosseum, but not lesser-known sites like the Palazzo Massimo or Baths of Caracalla (although you should!). •If you’re going to one site from each of the three categories above — for example, the Colosseum plus Palazzo Massimo plus Baths of Caracalla — you’ll save €4 per adult. You can buy the Archaeologia card at any of the sites themselves (the whole list is here), so you can make a game-day decision of whether to go for it or not. Also: is the Colosseum underground worth booking?, the best museum not on your list and where to find Rome’s best gelato. Liked this post? It’s one taste of The Revealed Rome Handbook: Updated, Expanded and New for 2017/2018, which includes many more tips and tricks like these in more than 200 information-packed — but never overwhelming! — pages. It’s available for purchase on Amazon or through my site here! I’m also free for one-on-one consulting sessions to help plan your Italy trip. Using any travel card to its ‘full potential’ in order to actually make any savings is usually impossible due to time constraints. It might also force you to cram in more than what you can handle, which might take away some of the visiting pleasure. With proper research one can beat any of the card’s offering on its own. I agree with Dan. Many of the places on the cards are so fascinating that you will probably spend more time than planned at some, to the exclusion of others that buying the pass earned you entry to. So…you wasted the money. It would be better to do some research and decide what is most interesting (for the trip you are about to take) to you. Book the tickets on-line. And then go and enjoy the sites you decided on. Rome’s not going anywhere…and you’ll want to return. Haha, great point. But it’s the same as the online entry (eg one site), so not quite that bad.